With all the cheese and leather of 1970's cops shows, "U.B." takes to the screen. Unlike "Charlie's Angels" (the movie), "U.B." has no TV series namesake to spoof, so instead, it spoofs itself. "After great leaps during the civil rights movement of the '60's, the black culture began to lose its flavor" (insert video of Mr. T., Urkel, and Dennis Rodman in a dress). The Brotherhood (a secret underground spy agency) sets out to bring down "The Man." In this case, The Man is a single villain devising his evil plans from a diabolic mansion resting on the stereotypical bad-guy island. The Man is never seen, instead U.Brother concentrates his energies on Chris Kattan playing Mr. Feather, The Man's right hand white man with black man tendencies. (And he hates himself for it). Undercover Cop is a mustang, a wild untamed heart that knows how, where and when to unleash his blackness on the oppressors of the world ... and a few lucky hot babes as well. He teams up with the Brotherhood in a film that never stops being funny. Highlights: Caucasai-vision (meant to give U.brother the white man's culture in mere seconds). Conspiracy Brother thinks the NBA 3-point shot was instituted to give white guys a chance. A pseudo high-speed golf cart chase scene. Lastly, I happened to enjoy a camera spin wipe that leaves Mr. Feather nauseous. Lowlights: I can't think of any. Quick pace, no lulls, many silly bits and a soundtrack that knows how to back this kind of satirical comedy. It's a lot of good silly fun. "U.B." was born on a fledgling internet site two years ago. When Urban Entertainment was founded in 1999, the company put the word out to African American filmmakers that it was looking for short films or an animation series for its website. Novelist and screenwriter John Ridley stepped up to conceive and write a satirical series about a top operative working at a secret organization dedicated to ensuring equality for all. 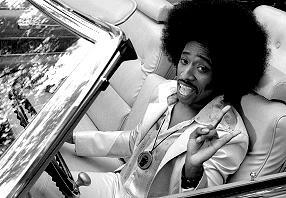 Undercover Brother. Copyright © 2002. Rated PG-13. Starring Eddie Griffin, Chris Kattan, Denise Richards, David Chappelle, Aunjanue Ellis, Neil Patrick Harris, Chi McBride, Gary Anthony Williams, Billy Dee Williams. Screenplay by John Ridley and Michael McCullers. Produced by Brian Grazer, Michael Jenkinson, Damon Lee at Universal/Imagine.